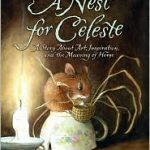 I have the pleasure of bragging about another dear friend’s book… Henry Cole’s first novel “A Nest for Celeste: A Story About Art, Inspiration, and the Meaning of Home.” You may know Henry by the numerous picture books he’s illustrated, including our book “Z is for Zookeeper.” I had the chance to read “A Nest for Celeste” in it’s early stages and knew that it was a winner, but I had no idea how beautiful the final novel would be. I’m proud of you Henry! Henry’s illustrated novel is as beautiful as poignant. I loved it, and I know all of Henry’s fans and admirers will too. ← Cryptid Hunters Face Book Contest.